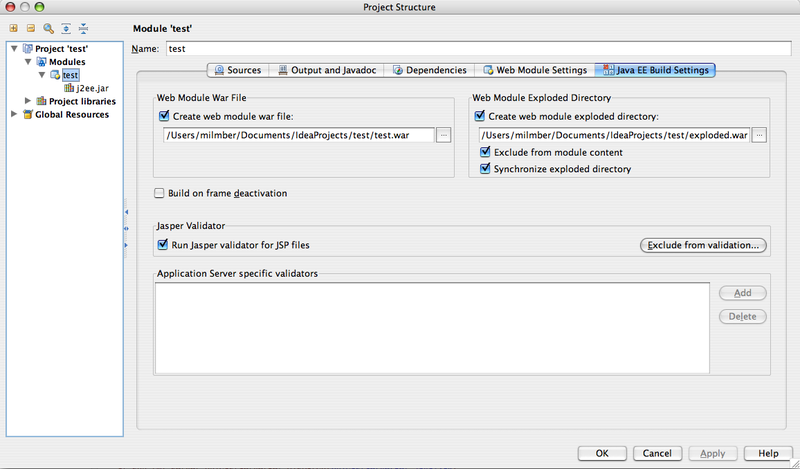 I'm trying to deploy a simple webapp to a JBoss remote server. I can connect to the server and everything is fine ( Idea connects to the remote JBoss instance), except...that the created war is never deployed. The JBoss instance looks for the war using my local war generation path. See the attached screenshots for my config. Tested and not working with IDEA 6.0, 6.0.1 & 6.0.2. Am I missing something obvious here? org.jboss.deployment.DeploymentException: url file:/Users/milmber/Documents/IdeaProjects/test/test.war could not be opened, does it exist? In the first place you have to blame JBoss for not being able to handle this case automatically. When invoking the JBoss deployer remotely and instructing it to deploy your webapp, only the archive file's URL is sent to the server instead of the whole file. So the solution we're heading for is to transfer the file onto the target machine prior to deploying it. But this work isn't finished yet and there are still some errors in IDEA core which are preventing it from being finished. Please vote for http://www.jetbrains.net/jira/browse/IDEA-10173 if you want to speed up things. Thanks for clearing that up. I will add my vote. The bug description in JIRA doesn't look related to JBoss. Are you sure, that it's the right one? Also, the solution could be to tell IDEA and respectively JBoss what URL to use on the remote machine. 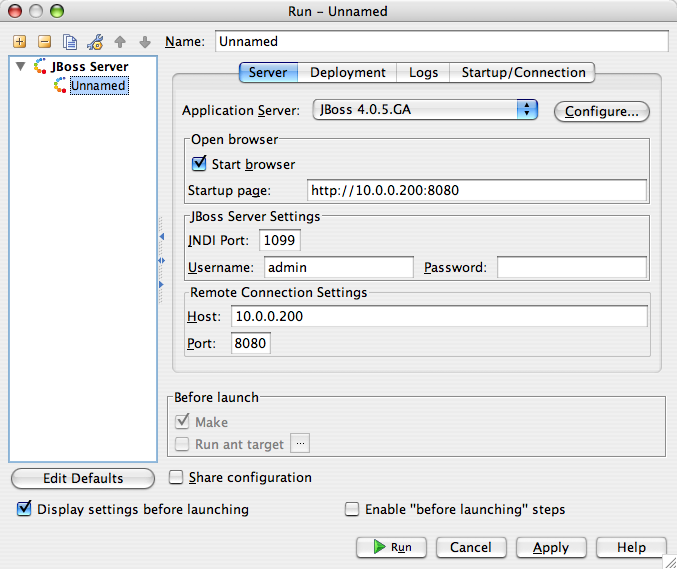 In that case we could copy the file to the remote server and initiate the deployment with "remote" URL. JBoss. Are you sure, that it's the right one? Well, yes, I'm very sure. It's not directly related to JBoss, but it's the location where the JBoss plugin will be hooked in. 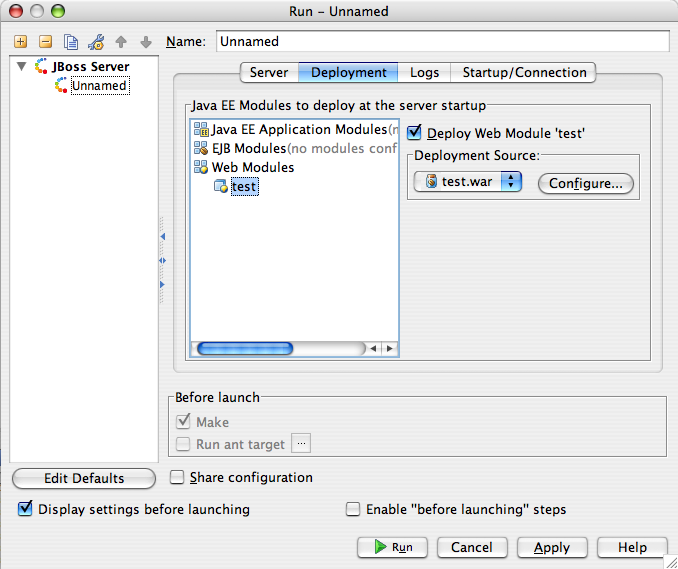 If you are willing to interrupt the make/deploy cycle by manually copying the file, then you can as well copy it directly into the deploy folder and let JBoss deploy it automatically. I don't see any added value in using IDEA's remote deployment mechanism if you have to copy the file manually first.